Armed with a projector and a laptop, I organized endless Ebola prevention training sessions section by section for the peacekeeping personnel and other UNMIL staff. Anti-Ebola posters were handed out to attendees, and I made sure all anti-Ebola UNMIL directives were strongly enforced on the ground. 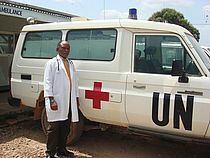 Monrovia, Liberia: As a UN Volunteer Medical Doctor with the United Nations Mission in Liberia (UNMIL), my work involves providing clinical healthcare to all UN national and international staff members, as well as to the UN peacekeeping uniformed personnel. During the Liberia Ebola epidemic, my regional duty station was Voinjama, which is close to both the Guinea and Sierra Leone borders with Liberia. These national borders became popularly known as the “Ebola Gateways”, since it was believed that the first cases of the Ebola virus entered Liberia through these borders in May 2014. All eyes and attention were focused on my regional duty post both nationally and internationally. As the only UNMIL regional UN Volunteer Doctor in this region, I was indefatigably delivering Ebola prevention health lectures to various groups of UN personnel. Despite all the prevention guidelines and sanitation vigilance in fighting Ebola, it was tragic that one of our staff still succumbed to the disease. The UNMIL medical staff was so affected that our resolve grew firmer and stronger not to lose focus in the fight against Ebola. Since moving from my regional duty station to Monrovia, I have pursued my commitment with the mission’s anti-Ebola actions by participating in the dissemination of Ebola statistics carried out by the Liberian Ministry of Health through Ebola Bulletin Updates. Volunteerism, whether carried out at the home front, workplace, community level or at world stage demonstrates special noble values that benefit all humanity. Bio: Dr. Patrick Chukwudi Nzene (Nigeria) is a UNV Medical Doctor with the United Nations Mission in Liberia (UNMIL). He had previously served under the National Health Service in his country for over two decades. He has a degree in General Medicine by the University of Medicine and Pharmacy Cluj-Napoca in Romania, and a Master’s degree in Public Health by the Obafemi Awolowo University of Ile-Ife, Nigeria.